We just recently had our first cold snap of the season. Depending on where you live, the mid-30’s may not seem like much of a cold snap, but here in central Texas, it’s about as cold as it normally gets. It’s kind of a thrill nowadays to see my breath in the air. Chilly mornings like this one get me thinking about the many glorious snowbound winters that we had when I was growing up in Denver. I can say glorious now because as a kid I didn’t have to chip ice off the car windshield, shovel snow off the driveway, or brave the slippery streets to get to work. No, for me, bad weather days or snow days meant one thing: I didn’t have to go to school. And for this dyslexic guy, the only thing better than not having to go to school was getting to spend the day out in the snow. 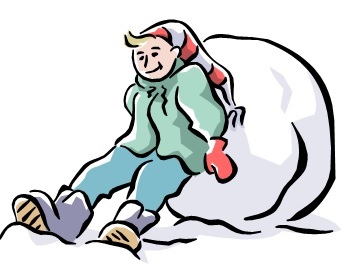 Snow days meant building snow forts, snowball fights with my siblings and neighbors, and my favorite…sledding! Some of the neighborhood kids had actual sleds but the majority of us had to improvise. We used everything from plastic trash bags to flattened cardboard boxes. Sometimes the boys with sleds found that using a trash bag or flattened cardboard box worked even better. The hill behind our house got a real workout on snow days. Those are some great memories. school’s closed ‘cuz it snowed in the night! and was ready to go at first light. who wants to be stuck inside sittin’? I’m goin’ out with the kids on the block! we had hours and hours for play. such days were too cold to hold school. That last paragraph of the poem is great! Although living in rural Western NY we almost NEVER had school cancelled b/c we all lived too far to walk.